HBO Luck premiere: David Milch’s new horse-racing drama is a winner. David Milch’s new horse racing-drama surges toward greatness. Still © 2011 Home Box Office. All rights reserved. 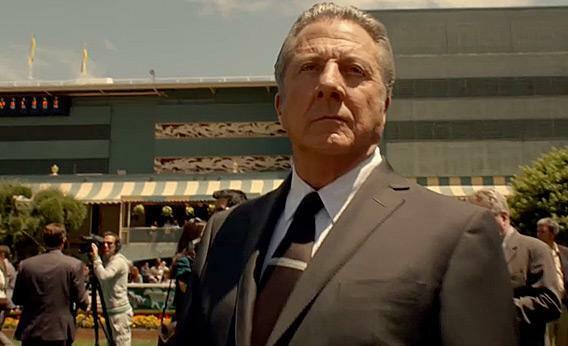 HBO premieres Luck, a new horse-racing series starring Dustin Hoffman and Nick Nolte, this Sunday at 9. Back in December, Troy Patterson assessed a special showing of the pilot episode and pronounced it a winner. Producer David Milch tempers the mythmaking with gritty historical detail, Patterson said, and characters spit out their lines in an addictive rat-a-tat that will have you grinning even as you try to set up closed captioning on your TV. The review is reprinted below. Last night, after the season finale of Boardwalk Empire, HBO aired the very fine pilot of Luck, presenting an early look at a horse-track drama that properly debuts on Jan. 29. To be sure, the channel’s primary goal in this scheduling was to instigate some word-of-mouth marketing—to make a micro-event of a pseudo-premiere of a series created by two major talents, David Milch and Michael Mann, and starring genuine movie stars not yet put out to pasture, Nick Nolte and Dustin Hoffman. But nor can we escape the impression that HBO was generously offering viewers a kind of early warning. If you were gripped by the episode’s thrilling race sequences and tense moments of drama but remain fuzzy on its nuances, then you’ve got a whole month and a half to figure out how your TV set’s closed-captioning works. Luck, with its bright light by turns buttery and frigid and its pace sometimes ambling contentedly and sometimes trotting hotly, boasts a distinctive voice. In terms of literal voice, what is most distinctive is that the rhythmic dialogue gets delivered in a fashion confidently approaching the edge of unintelligibility. The textured paddock patter and gambling slang were easy enough to sort out, but then there was the gallery of marble-mouths dripping pearls of wisdom. The Latin-American accent of the trainer played by John Ortiz was thicker than a high-roller’s bankroll and a matter of comment within the episode, with one character suggesting that the trainer played it up as a matter of bewitching and bewildering various gringos. The dense muttering of Dustin Hoffman’s character indicates the power of a gangster accustomed to being listened to by people whose lives depend on understanding his every word. And Nick Nolte, mumbling and grumbling as a ruminative trainer who enjoys a metaphysical bond with his horse, might as well be communicating by rolling the balls of the feet over gravel to trace out runic script. It’s worth mentioning that the surname of the trainer is Escalante (which has the ring of a present participle hurtling itself to allegorical heights), that the nickname of Hoffman’s character is “Ace,” and that Nolte is portraying a person listed simply as “The Old Man.” It is an indication of Luck’s terrific tonal control that this stuff is not totally ridiculous. Because the show is grounded in the grim specifics of the life at a fantasy version of Santa Anita Park—and because it minimizes its sentimental mistiness about equine nobility and human hopefulness—it wears its archetypes handsomely. Why, it doesn’t even grate when Jason Gedrick, playing the greasiest and most degenerate of a crew of Pick Six bettors, stands up with perfect posture (for the first time in decades, it seems possible) and starts mumbling “America the Beautiful” when his long shot crosses the finish line. Listen closely and you’ll hear the elegant approach of a machine built to refresh a myth about the goddess of fortune.